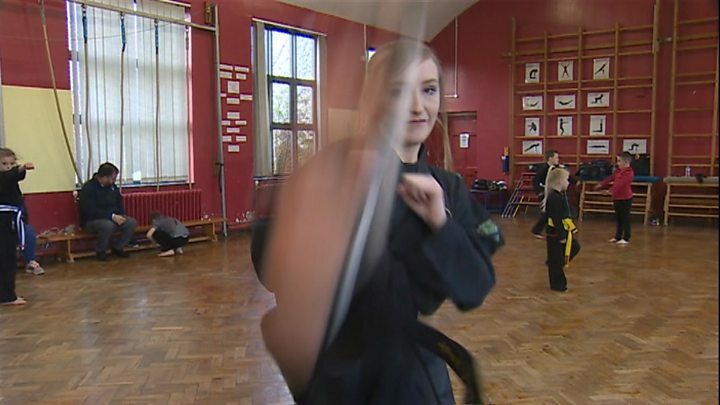 When young carer Bethan Owen took up karate it was merely as a means of “distraction” from looking after her mother who has epilepsy. “I don’t know what I would have done without karate – but now it’s just me being me, I love helping people,” she said. “We all lived with mum’s epilepsy,” she said. “Mum has had the illness as long as I can remember, which was hard as a child to see it and always be worrying about it. “Me and dad always have to be there for her, so she’s not alone in case anything happens. “I enjoyed it because it really distracted me from what was happening at home. “I opened this class to help the less fortunate and to distract them from what’s going on in their background,” she added. “I know what their experience feels like. I can see the worries they have. But karate is time away from that. 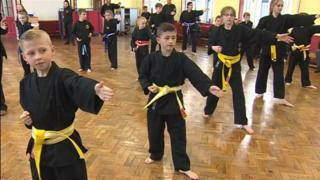 Image caption Her father Garry says karate has “brought the family together”. “Bethan has maybe had to grow up a bit quicker than most. 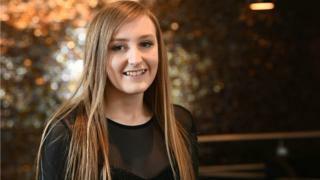 That’s been her life really from the age of four,” said her mum Julie. One of her young pupils, Kira, said she started because she was “afraid”.